As part of Bela Lugosi’s tragic slide downhill in career terms, 1946 only yielded one film role for him, which was then not even released until a year later. 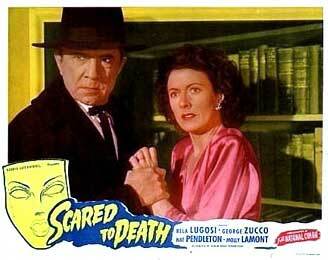 Scared to Death (1947) was a lame and very low-budget offering by an alliance of producers working under the banner of Golden Gate Pictures. Its only redeeming value for Lugosi fans is that it remains the only starring role he had in a colour picture. (According to IMDb, his only other colour appearances were in a short film promoting war-time blood donation and as the uncredited and unflatteringly named Hungarian Ambassador Count Von Ratz in the 1930 operetta Viennese Nights). The process used is optimistically named ‘Natural Color’ in the credits – actually the widely used two-strip Cinecolor format instead of the more costly Technicolor three-strip. Cinecolor was in its heyday at the time, being used by the bigger studios as well due to its speedy printing turnaround time and the fact that it could be shot using existing black and white cameras. So helpful was the inventor William Crespinel that he was given the lynchpin part of Rene at the movie’s end. In Gary D. Rhodes and Bill Kaffenberger’s exhaustive and invaluable No Traveler Returns, they describe in some detail the inspiration for the film: a lurid real-life Chicago murder trial in 1933 involving reputable Dr Alice Wynekoop whose daughter-in-law Rheta was found dead on her home operating table. Wynekoop claimed that her use of chloroform was unintentionally fatal; however, to cover herself, she had shot the corpse with a bullet to fit a botched burglary story. A trial revealed extra-marital philandering on her son’s part, but the real smoking gun was the discovery that the doctor had taken out a valuable life insurance policy on the deceased woman. The following year theatre director Frank Orsino wrote a successful stage play based on the case, Murder on the Operating Table, which was then turned into the film (under the original shooting title Accent on Horror) scripted by Willian Abbott. The director was Christy Cabanne who, like Lugosi, was on a downward trajectory from B-pictures such as The Mummy’s Hand (reviewed earlier) to even lower depths working for Poverty Row outfits like PRC and Monogram. 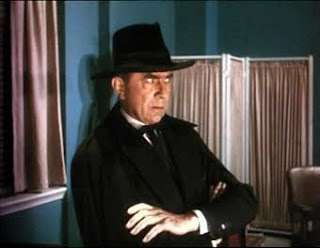 For this movie, the scheming fictional version of Wynekoop is the reliable George Zucco as Dr Joseph Van Ee, who cannot persuade Laura to divorce her son Ward (a stiff Roland Varno). Fortunately, proceedings are enlivened by the flamboyant entrance of Bela Lugosi, vivid enough in full opera-cloaked ham even without the benefit of colour photography. He plays the famous magician Professor Leonide accompanied by his little person sidekick Indigo (Angela Rossitto). Although he stood at only two feet eleven inches, Rossitto’s career stretched across six decades including 1932’s Freaks and two previous turns as a Lugosi man-servant in the forgettable Spooks Run Wild (1941) and The Corpse Vanishes (1942) both reviewed here. Lugosi seems to recognise that Scared to Death can’t be taken seriously and declaims most of his lines with the heavy portentous squint of a pantomime villain, at one point reciting a rhyming couplet of dark intentions as if doing an aside to a theatre audience: “Laurette, Laurette I’ll make a bet/ A man in green will get you yet”. Virtually assisting him in this department is Nat Pendleton as former detective nincompoop turned private security nincompoop Bill Raymond looking for a juicy murder to get him back in with the force. Pendleton was a wrestler before becoming an actor yet comes across more as an ex-boxer with his thick-ear, broad comedy physique and vocal style. He’s an amiable lunk and its easy to see why he was plugged into multiple sequels of such series as the Dr Gillespie and Dr Kildare films as well as both of Abbott and Costello’s Buck Privates comedies. He is kept busy whilst scoping for a case to crack by pursuing Lilibeth (Gladys Blake) the Van Ee’s streetwise housemaid. The plot, which bears little scrutiny, turns on Laura’s real background as Laurette, one half of the married dance duo Rene and Laurette in occupied wartime Paris, thus potentially enabling Ward to claim convenient dismissal of his marriage to her as bigamous. Theirs got off to an ignominious start by him getting hitched to her one night as a bet. What follows is very much a stage-bound chat-fest without the benefit of any exteriors to lift the monotony. Sporadically Laura is haunted by what is meant to be a green mask echoing her old dance partner’s costume, yet in Cinecolor it looks more like a floating cameo from the Blue Man Group. When she goes missing, Zucco’s reaction amusingly telegraphs his relief: “Oh, how dreadful” he deadpans. The energy level is lifted somewhat by the involvement of newshound Terry Lee (Douglas Fowley) and his airhead girlfriend Jane (Joyce Compton). Fowley later gained recognition as the film director struggling to get a sound performance out of his silent movie female lead in Singin’ in the Rain (1952). Here, his force of will grills everyone with the directness of an investigative cop rather than a reporter – “I want the facts and I want them now!” – begging the question as to why the houseful of suspects don’t just tell him to buzz of and clean his typewriter since he has no actual jurisdiction over them. Eventually Laura’s murky past catches up with her: she had cruelly shopped Rene to the Nazis for one million Francs to get away from his overbearing behaviour, not realising that he would (inexplicably) meet the Professor in a concentration camp and hatch a plan to be avenged. Lilibeth, who appeared to be killed by the mystery assailant, is revealed to actually be under a hypnotic spell. No such happy ending befalls Laura: before Rene is finally unmasked he gets his revenge by literally scaring her to death. This at least means that the film’s title is accurate, even though the contents are a wasted opportunity to showcase one of horror’s most beloved icons in colour.